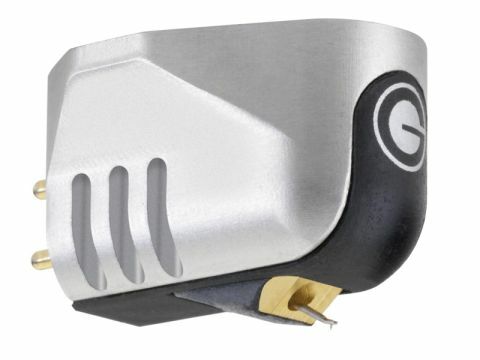 Goldring's Legacy is the most ambitious moving coil cartridge yet produced. At just under £600 it doesn't seem all that excessive by high-end standards, but compared to Goldring's usual fare which doesn't break the £400 mark, it's quite a jump. Unlike the company's other moving coils (and magnets for that matter) which are made out of moulded Pocan plastic with a black finish, the Legacy has a cast magnesium body chosen for its low mass, high rigidity and low resonance at the appropriate frequencies. The moving parts consist of a Vital fine line stylus on the end of an aluminium cantilever. It's suspended in a bespoke rubber compound that's said to ensure optimum compliance and the recommended 1.75 grams tracking force and 16mm/N static compliance puts it in the moderate range that should suit a wide variety of tonearms. The coils attached to the back end of the cantilever are hand-wound using high-purity copper and one has to assume that there are not that many windings because the output is a low 0.3mV. This means that there is less mass to keep under control and greater demand placed on the phono stage which has a smaller than usual signal to amplify. Set up is assisted by threaded inserts in the cartridge body and short bolts in the box – our usual bolts proving too long for the job. The stylus is easy to see which helps with alignment. The Legacy proved quite sensitive to set up, especially when it comes to downforce and the impedance at the phono stage. Its requirement at that point is 100 ohms, which is pretty much the standard for MCs, but some will work more effectively into higher and occasionally lower loads. Trying both one Kohm and 47k to see what it would do certainly makes a difference, primarily affecting the shape and coherence of the image. At 100 ohms you get a well focused centre strong image, increasing the load seems to broaden the soundstage but leaves a hole in the middle. Downforce variations from the 1.75g has a distinct effect, too. Reducing downforce adds a bit more zip and excitement to the music, but this is probably because the cartridge is having more difficulty tracking. Turn it up even 0.2 grams and while there is a slight increase in bass weight, this is offset by a reduction in timing quality. It would seem that Goldring has got the specs just right for this sample, at least. Its key skill seems to be in the timing department: it can really pick up a rhythm line and run with it thanks to impressive speed when it comes to defining the beginning and end of notes. The Keith Jarrett Trio's Yesterday's album really swings in its grip. There isn't quite as much body or power as some at the price, but there's no denying that it has considerable finesse. A van den Hull DDT II provides the contrast, adding considerable substance to a Rickie Lee Jones piece that makes the recording seem far richer than you get with the Goldring. That said, the Legacy fares well in comparison with CD, it adds openness in the usual vinyl fashion and brings out the mood of the music rather better, but remains tonally close to the flat line of the digital medium. The Legacy is a neutral and precise cartridge with an eye for detail – it will always pick out cymbals – and some will prefer a more romantic sound from their vinyl. It does, however, deliver a revealing clean and dynamic version of events and can easily combine the vibe with the finer points of the sound.